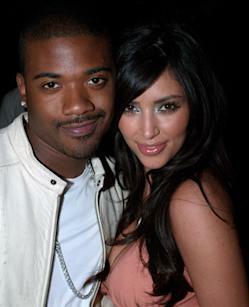 Ray J says that people have misinterpreted the song. “When people first heard the lyrics or read the lyrics online they kinda took the song somewhere it wasn’t supposed to go,” he says during a phone interview with Yahoo! Music. The singer and actor says “I Hit It First” is just a fun song. “It’s life put into a music form from my perspective,” he says. Ray J’s explanations aren’t convincing. 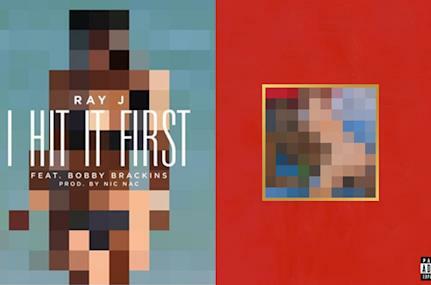 When asked if Kardashian is the woman behind the pixelated single cover artwork that is conceptually similar to West’s My Beautiful Dark Twisted Fantasy cover, Ray J dodges the question. “I can’t really say what the picture is because it will give it away,” he says. Clearly, the whoopla is upsetting the Kardashians, who have not publically addressed the song. Has Kardashian’s staunch momager Kris Jenner contacted him to complain? Ray J jokes about screening his calls. “I can’t tell you who tried to call me though 'cause I don’t know ‘cause when it says blocked, I push end quick,” he offers with a laugh. He does admit that he felt good when he learned that West rapped “My girl a superstar all from a home movie” on his song “Clique.” “A few people called me and I was like, ‘That’s what music is about, talking about real life,’” he recalls. While Ray J is in damage control mode in an effort to redirect what is being reported about the song, he couldn’t be happier about all the attention he’s getting. Ugh, good luck with that, Ray J.